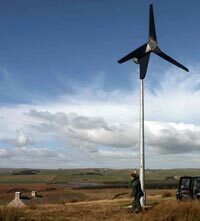 Wind Power, Wind Energy, Wind Turbines, From Case Electrical Services Ltd. The world's wind resource is huge. Global demand for electricity could be met by wind power alone several times over. The presumption, however, is that it is neither technically nor economically feasible to run power systems in which wind power meets most of the demand most of the time. That presumption is wrong. Yet it remains an enduring myth, also in wind energy circles, and is probably the single most damaging piece of fiction that could prevent the full potential of wind energy from ever being realised. A renewable energy system converts the energy found in sunlight, wind, falling water, waves, geothermal heat, or biomass into a form we can use, such as heat or electricity. Historically, renewable energy was used exclusively as man's energy source until coal was first used in the 13th century, oil in the end of the 19th century and uranium in the middle of the 20th century. Using renewable sources of energy promotes sustainable living and, except for burning biomass, is virtually pollution free. Case Electrical Services Can Make It Happen for You. When you first have the idea to go green, how do you make this come true. Case Electrical Services can take your ideas and make them a reality. We will Project Manage all aspects, from the Design to Installation and Completion. the connection to your home or business. We can connect you to the National Grid to sell back the excess energy you produce. 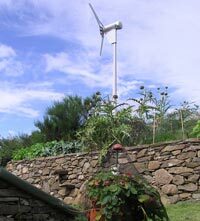 Grants are available from the government to install renewable energy systems. Wind power and solar power are complementary in the sense that when a wind resource is not available, sunshine often is. If both resources are available, then a hybrid system is the more economical approach. A hybrid system uses fewer batteries and the battery bank is cycled less, which results in longer battery lifetimes and lower costs. 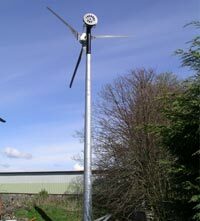 Harnessing wind energy was one of man's earliest achievements. Small windmills pumped water in ancient Syria and sailing ships used windpower to first circumnavigate the globe. The modern use of wind turbines originated in the 17th Century where the Renaissance Dutch used wind power to recover hundreds of thousands of acres of land by draining the Rhine River delta. The classic Dutch windmill design predominated for 300 years, pumping water, grinding grain and sawing wood until the multibladed American Farm Windmill was developed in the middle of the 19th century. These machines covered the continent, pumping water on every farm and in every town until rural electrification (and rust) brought about their demise in the middle of the 20th century. Wind is a form of solar energy. Winds are caused by the uneven heating of the atmosphere by the sun, the irregularities of the earth's surface, and rotation of the earth. Wind flow patterns are modified by the earth's terrain, bodies of water, and vegetation. Humans use this wind flow, or motion energy, for many purposes: sailing, flying a kite, and even generating electricity.